I am rounding that homestretch right before vacation. You know the one I mean. It’s only a few days, but it feels like time is ticking backwards till you can finally have a drink or 4 and sleep in the next morning. Anyhow, I realize I didn’t show you a manicure last week, and that’s because I didn’t really have time to do one because of Super Important Work Stuff. I just took the opportunity to let my nails breathe a bit. 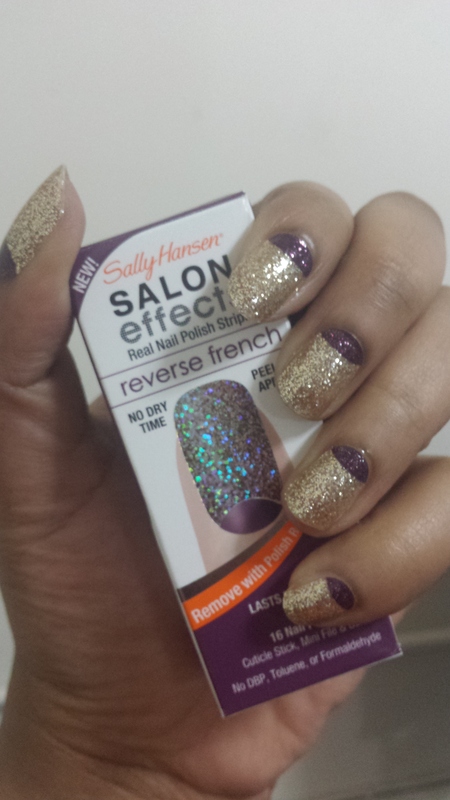 But the night before Super Important Meeting, I stopped by the store to grab some pantyhose and some Sally Hansen nail stickers caught my eye. So, the box made it as though the half moon was matte and the rest of the look was glitter, but I was pleasantly surprised to see that it’s glittery top to bottom! There are a couple more reverse french looks I want to try, as well as some twists on the classic french I’m picking up soon. Totally a go to when I just don’t have the time to do a full nail look but want to be polished. Hmm. Nail design or stickers this week? Stay tuned!